Between April 21-22nd, 2016, over twenty scholars from Africa, Europe, and North America took part in a global conference dedicated to the scholarship of Islam in Africa. The conference was organized by Northwestern University’s Institute for the Study of Islamic Thought in Africa, the Program of African Studies, and co-organized by American Islamic College, and the University of Illinois at Urbana-Champaign’s Center for African Studies. The conference was on, “Sacred Word: The Changing Meanings in Textual Cultures of Islamic Africa,” which was dedicated to the memory of Dr. John Hunwick, the renowned scholar who “worked to change the perception that Africa was a continent lacking written records.” It explored the meanings of textual cultures in Muslim societies in Africa and the changes that have taken place in those cultures during the last two centuries. 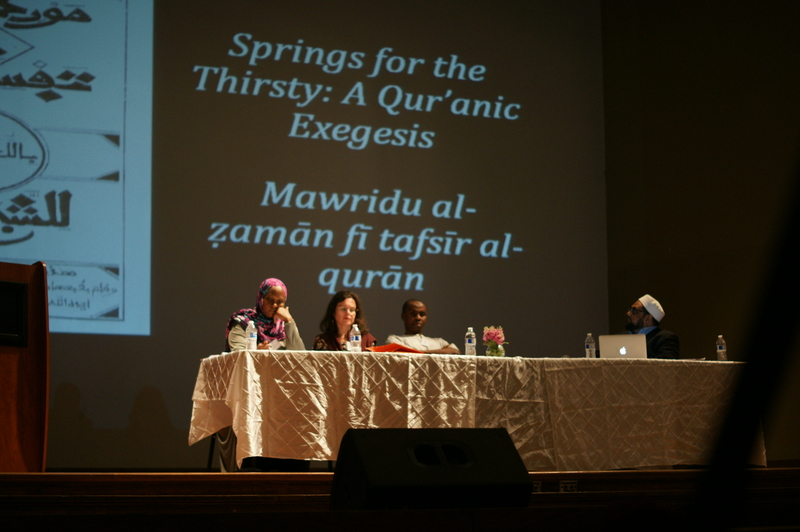 The panel on “Transmitting Knowledge, Finding Meanings: The Holy Qur’an” was held at the American Islamic College’s historic auditorium. AIC’s Asst. Professor of Arabic & Islamic Studies, Jawad Qureshi, served on the panel as the discussant. Corinne Fortier, Anthropologist of Centre Nationale de la Recherche Scientifique, presented on “Power and Embodiment of Qur’an Sacred Words.” Afis Ayinde Oladosu, scholar of Arabic & Islamic studies from the University of Ibadan, presented on Dalail al-Khayrat of S.M. al-Jazouli’s “Sacred just like the Qur’an?”. Jeremy Dell, Historian from the University of Pennsylvania, presented on “Reading the Qur’an in Wolof: The Tafsir of Muhammadu Dem.” The discourse presented on the culture, history, transmission, and translation/interpretations of the Qur’an in various Muslim African communities brought to light the richness of scholarship on the Qur’an in Africa that is full of critical depth. After a thoughtful Q & A session, the panelists, scholars, and attendees enjoyed a delectable reception hosted by AIC in the Reception Hall. Guests were warmly welcomed by the President, Dr. H. Ali Yurtsever. AIC was pleased to collaborate with Northwestern’s ISITA on this important conference and was honored to welcome its international scholars to AIC’s campus.